I was excited to hear that Spicy tones- rust, burnt orange, reds, mustards, and the like, were going to be in stores as part of the Pantone Colors of the Year and as a trend ( on the runway). When I saw this Samar rust-cognac blouse, with tie detail at the sleeve, and tortoise buttons down the front, I was in love! I was envisioning this paired with different jeans, skirts etc for the warmer months. This yard dyed twill blouse is light and airy feeling. I told you I was loving neutral shades too and having a closet of many colors, I wanted to add these versatile pieces. I have been on the hunt for olive paper bag waist pants for the Spring/Summer, and they would look awesome with this too. 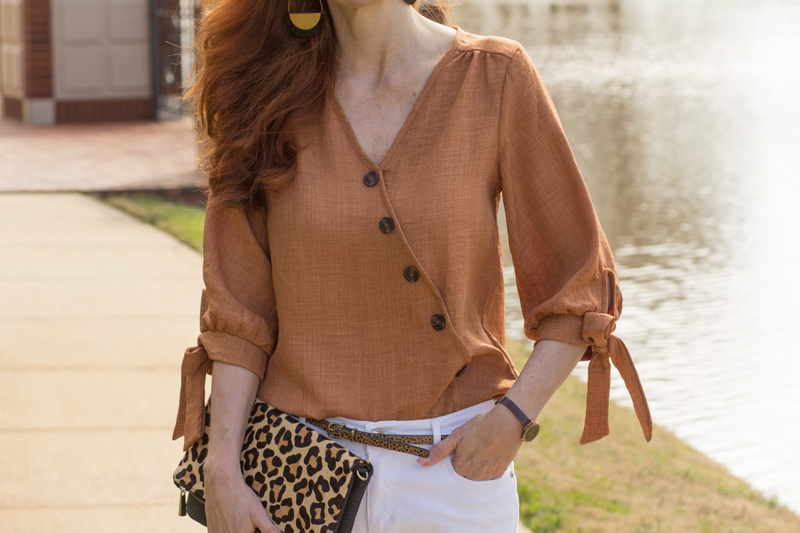 I like the contrast of this cognac blouse with white denim and added a skinny leopard belt for more pattern. The shoes, how cool are they? Many styles are being shown with architectural heels- geometric styles, with a different shape. 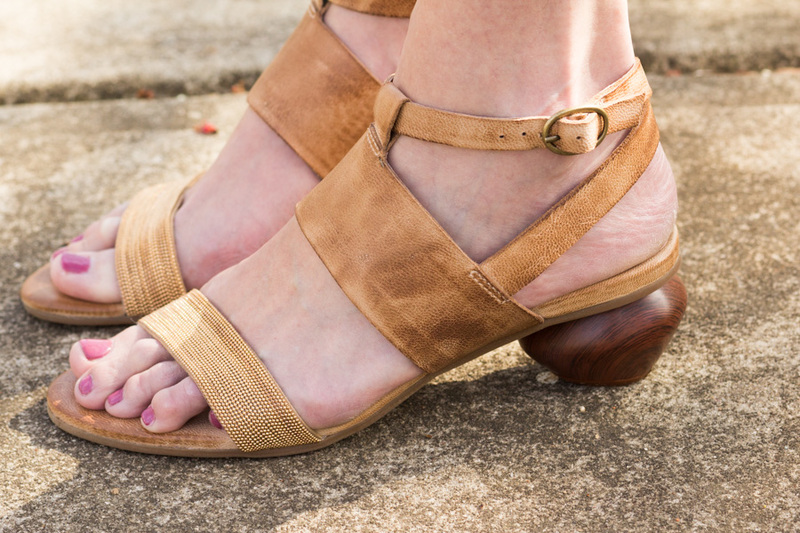 I loved this dark wood, egg-shaped heel by Antelope for its modern look. 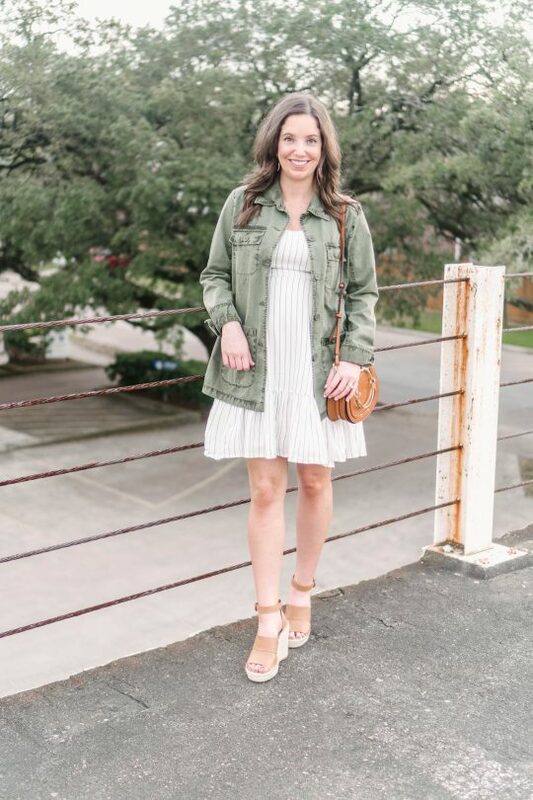 The distressed taupe leather strappy sandal would be perfect with so many neutral looks in my closet and I loved the beaded coppery strap at the front as well. They are beyond comfortable! For added print and texture, I am carrying my Express Leopard clutch. I also could have added the woven straw bag that you have seen me carry last summer- and I chose to add it to the second look here. 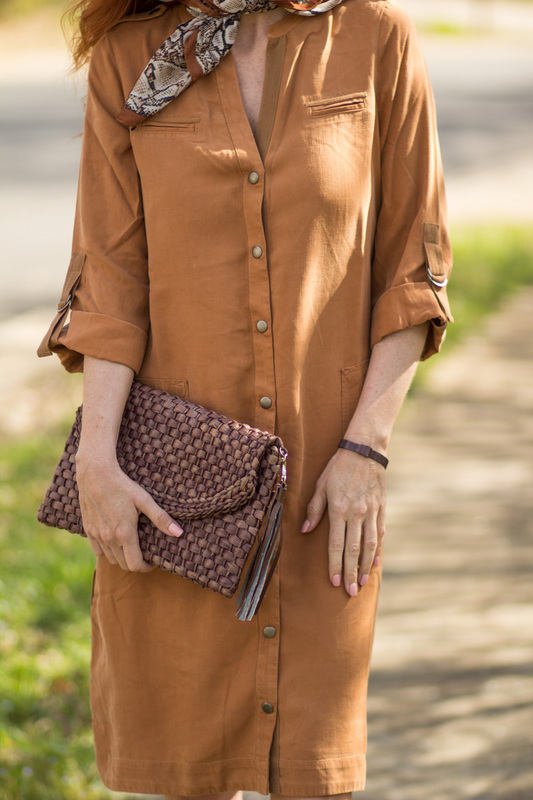 The second look is the Malindi Tencel Shirt Dress with 3/4 sleeves in the shade, Safari. Now, where is my straw hat and sunglasses? Tencel Lyocell is so soft and easy to wear, and as a shirt dress style, this dress can be styled in many ways. This dress, as all of my tops and dresses from Soft Surroundings, is an XS, and has a roomy fit. I could wear a belt with it, or leave it more relaxed, as it is. I love the Safari color I am wearing, but it also comes in a Silver Sage, or sage green color. I could see that color looking amazing on ladies with silver or grey hair too. 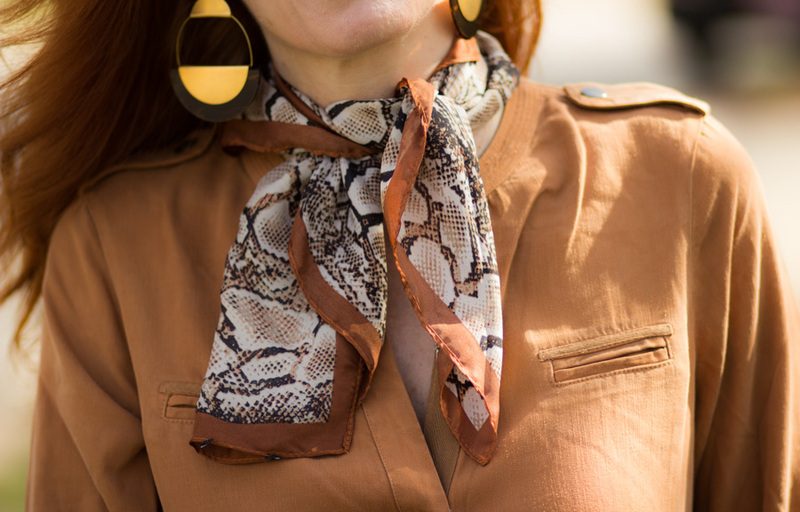 I bought this gorgeous snakeskin scarf from Mango, as I am looking to add more neck scarves to my closet. They are a great choice instead of a necklace in the hotter months. 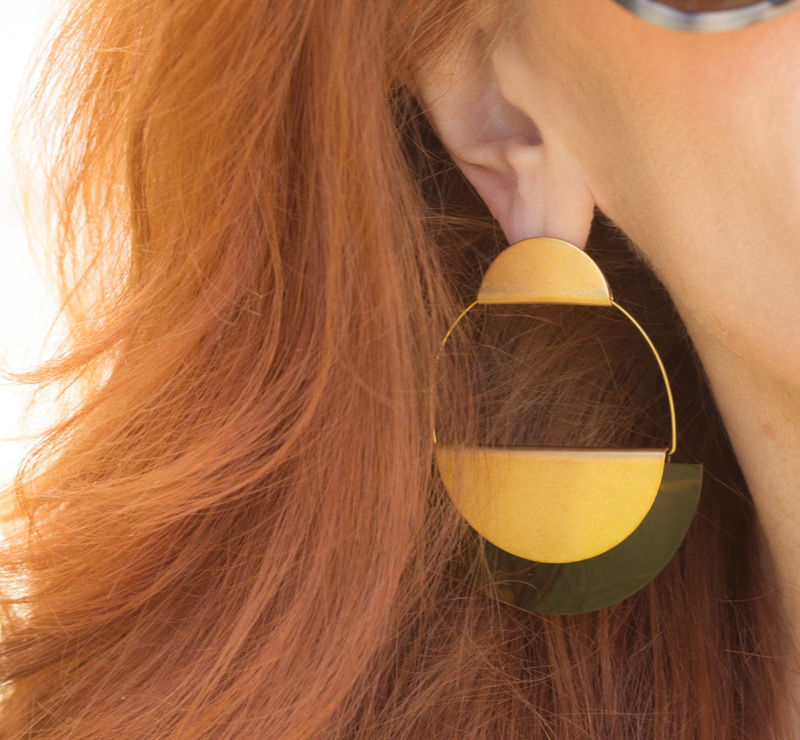 These gold tortoise earrings are large and make a statement, and I love with them my long hair. These are sold out, but I love these other styles as well with this look. These resin tortoise hoop earrings have a classic vibe and will go with anything! These brass palm leaf earrings would look great with many of the Safari looks for Spring as well. ** Items in this post were gifted to me from Soft Surroundings. All opinions in this post are mine and truthful. Links to items are below and throughout the post. Click arrows to see items. I love both neutrals looks. Sooooooo chic!! Thank you for sharing this post with My Red Carpet. Such a pretty top. I love the button details and color. I love your outfit! The sandals are super cute! I love your style, especially those earrings. Now I know exactly what my summer style lacks. Thanks! I’m liking the mustard color right now, though I tend to like more color. It’s a nice change. 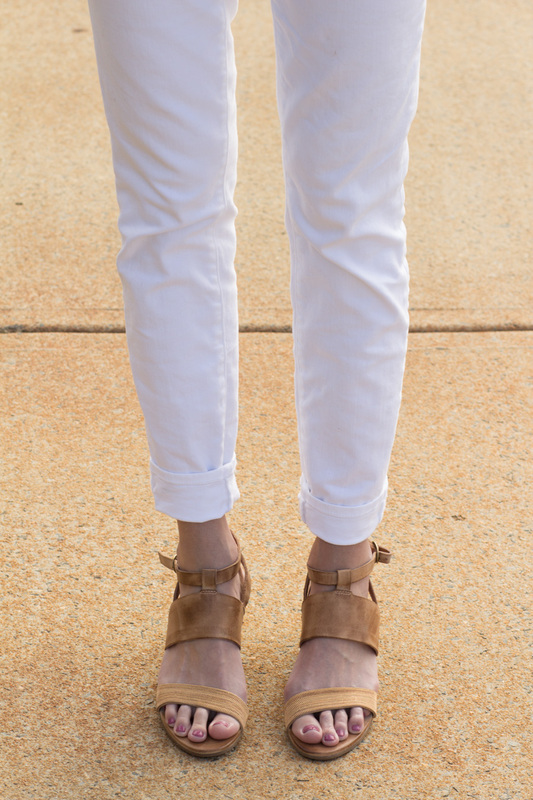 You are really rocking these white jeans and the cognac colored blouse is the perfect warm compliment . These sandals are very chic and look so comfortable too. And of course that dress! Those colours are great with your hair and complexion. The design on that blouse is lovely. 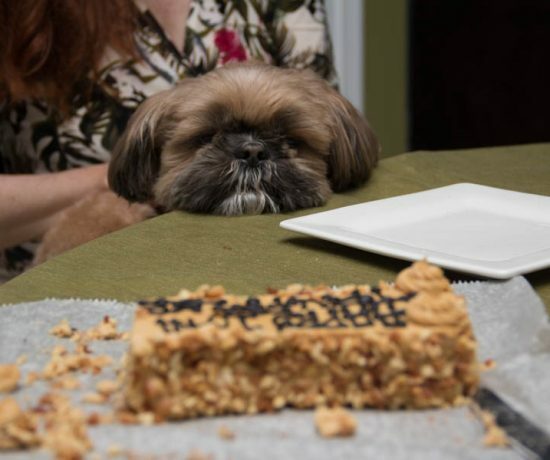 I can see why you chose it. The spicy colours look great on you Jess! I love both the top and the shirt dress…and those sandals are fab, I love the heels! Thanks for linking up! Love the spicy colors you selected from Soft Surroundings! 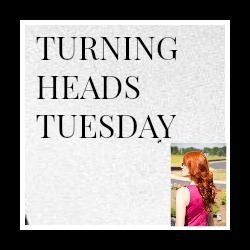 You have the perfect complexion and hair color to wear the spice colors! Those sandals are fabulous! Love the heels! The top and the dress are so cute! I love this button trend and am all about it for spring. You look gorgeous in this spicy color! These spicy/cinnamon colors were just made for you. I love how the buttons are kinda diagonal on that first top and I love the ties on the sleeves. That button down dress is so adorable with the neck tie. Love those spicy shades on you! White works so well with the cognac shade. Thanks for joining #WowOnWednesday! Jess, that russet color looks lovely on you with your hair and skin tone! Nicely done! And as always, you’ve accessorized the look perfectly! Those sandals are so unique! I just love the heel of them! And your blouse is beautiful! I can see why you were drawn to these items! 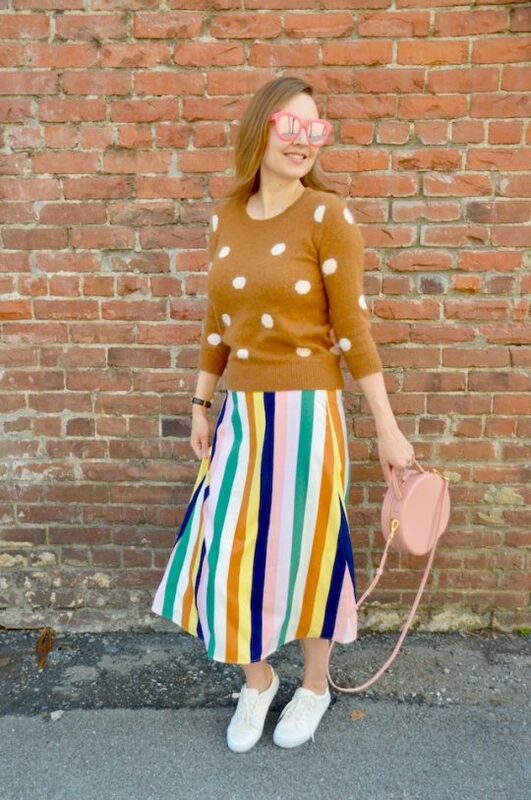 great post – you look beautiful in those colors! Are you Nutmeg Spice? 😉 All jokes aside, I absolutely love that blouse—the asymmetrical buttons are so unique and flattering, and you’ve styled it so perfectly with white jeans and leopard. 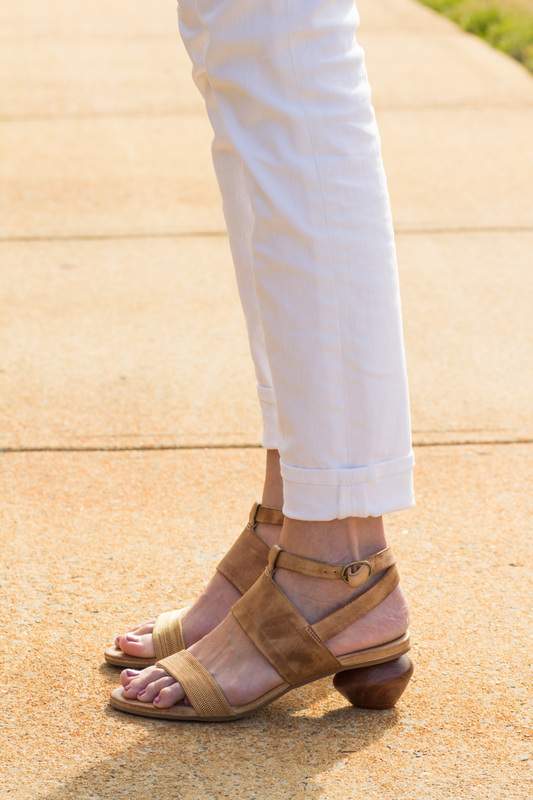 And the round heel on your sandals is so cool! This is a great combo and I love the colors. The shoes are incredible and the heel is super interesting. Haha, “Hi, Spice Girl!” Neutrals are okay with me. I really like the asymmetry on the top, great choice. Those cool sandals must be sold out already! I’m in love with that blouse and the unique heel on those sandals! So pretty! This is more my style! 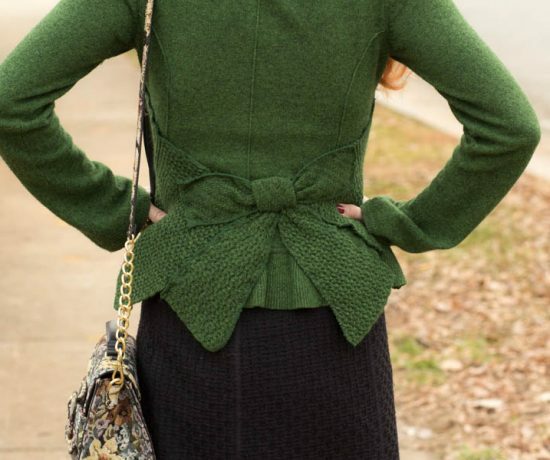 I’m loving this outfit, Jess- great for inching toward a new season! LOL! I love the Spice Girls! I actually saw them in concert years ago 😉 This color is incredible on you! Love the whole outfit! This outfit is a great example that you can wear pants even when your personal style is Romantic. You look stunning. Well done. Love the heels of your shoes. Loving these neutrals on you, Jess. And that bag is such a fun pop! Both of these looks are so pretty! I especially love your blouse, looks wonderful with your white denim! I love both outfits! Beautiful color! The blouse really calls my name. Just love the asymmetrical buttons, ties – everything! Well I’m not up going to complain about neutrals on repeat, you know I’m a BIG fan! Love that rust shirt especially! Hugs and have al great wee k, Mary. As a shoe girl…I am obsessed with those heels!! How fabulous!! 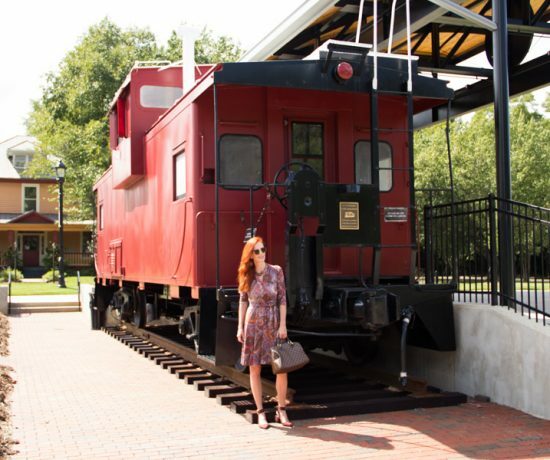 Love your outfits in this post, Jess! The details on the blouse sleeves and buttons are so cute. I love the brown tones with the white. Very pretty! I’ve always loved these colors together in fashion because it looks so sophisticated. Love the top especially. The design is so unique. What a lovely color combo! I don’t own anything in rust but maybe I should remedy that! Your blouse is so cute with the asymmetrical button detail! I love your sandals! The heel is so cool! That first outfit is one of my FAVORITE ever you Jess!! So chic and color amazing, just perfect for Spring! Oh Jess, these are such great spring outfits! The spicy colors are so beautiful on you. And those sandals are fabulous! What a cute heel! Love that top. I really like the neutrals trend going on this spring. I love neutrals so I happy seeing more of it! I have felt a lyocell shirt in the past and I do agree, softest and comfiest shirts ever!! Both outfits look great but I am leaning more towards the first look. I love the blouse and it just works so well with white denim. Clean, crisp and chic. It doesn’t get better than that! Wow Jess both of these looks are fantastic! I love the shoes, the bags, and the neutral tones look so great on you! I can tell that blouse and dress are so soft and comfortable. I love the way they fit you! The scarf is such a nice touch with that dress. I’d love to wear these outfits! Wow! I love Both items! Fabulous colors and I love the fabulous sleeve of the blouse! Cool dress! Love this neutral look with the pop of leopard! Thanks for hosting and featuring me today in your post! I love the blouse, Jess, the buttons across the front add such an interesting and captive details. The colour is great to be matched with others.